Research Application: The 1869 Census is the most complete population census, of great value to genealogical researchers. It contains the entire enumeration of all villagers, including residence, age, religion, and relationship. The other Census are generally enumerations of estate possessions, used for taxation purposes. Individual land ownership is enumerated, but usually only contains head of household and no demographic information. These notes which were originally written for Slovakia researchers are generally useful to anyone exploring Hungarian Census records. This includes present-day Hungary, Yugoslavia, Bosnia, Herzegovina, Ukraine, Romania/Banat and other pre-1918 Hungary territories. While there are specific notes and indices for Slovakia, many people have found this work useful for providing general guidance. 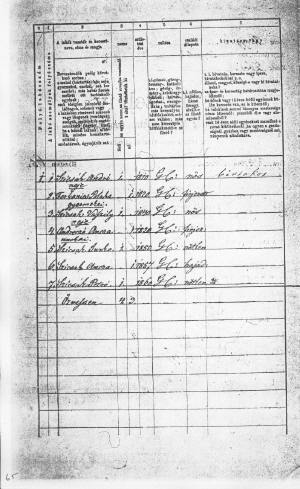 Alternate 1828 and 1869 Census translations by Victor G. Berecz, Jr. Many Census were conducted by the Kingdom of Hungary. We will make general comments about all, but will focus in on four census which are available at the Family History Library 1775, 1828, 1857, 1869. Reports about other available census are provided through the generosity of our readers. Please note that there are more census available in the Hungary Archives that are not listed herein. We have purposely focused on those census which we have first-hand knowledge. Prior to the emancipation of the peasants (1858) only the names of landowners were listed. The 1869 Census is of the greatest value to the genealogical researcher, as it required all residents be enumerated and is the most comprehensive of all available census. As a general rule, old, Magyar (Hungarian) place names are used in the census documents. Language of headings varies. Latin and Magyar are most common. It is sometimes found that the header is in one language and the actual entries in a second language. Listed in the table below is generally where the documents related to territories in Slovakia will most often be found today. 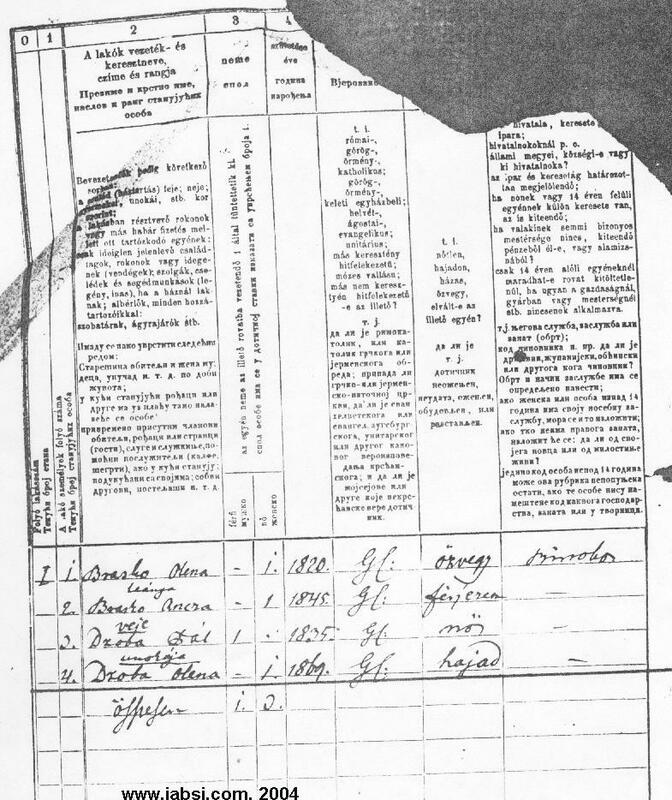 Most all pre-1918 census related to property in Slovakia have remained in the Hungary Archive. Note: There are many other census years not shown here. I am only illustrating those which I have exposure to. Hungary National Archives - either in district office or central office in Budapest. 1. Generally obtainable from the Hungary Archives district holding your records of interest (Former Zemplin county villages are still kept in Satoraljaujhely, Hungary the former county capital.) You may arrange to inspect the records personally or hire someone to go on your behalf. It has been reported that copies of these films can purchased from Central Archives in Budapest. 2. 1623, 1631, 1691 Are available online from Arcanum. 1775, 1828, 1857, 1869 Hungary National Archives Being filmed by the FHL. The FHL has significant but incomplete holdings of these documents, and not all records have been filmed or released. This is an ongoing, multi-year project. This is a "Urbarim Register" (possession inventory) for the Feudal Estates. It includes a listing of all village heads of household who owned property and its description. Not very useful for genealogy (family tree) research, but interesting in understanding the formation and growth of a village. This was a joint project of the Hungary National Archives and Arcanum. Peter Nagy has composed a very good tutorial on how to use the database. I have created an abbreviated set of instructions on using Arcanum, but Peter's work is more complete. You must use the Magyar (Hungarian) Name. You may query by any text, including but not limited to village name, estate name, surname. This is a "Urbarim Register" (possession inventory) for the Feudal Estates. It includes a listing of all village heads of household who owned property and its description. Available for purchase from the Hungary National Archives. Not very useful for genealogy (family tree) research. Juraj Kumičák purchased from the Central Archives in Budapest a microfilm roll containing 1715 Census records for all of Zemplen County. Price was approximately 50 Euros (2004). Contains over 350 pages (about 1-2 village per page). The 1715 Census is now available Online at Arcanum. This was a joint project of the Hungary National Archives and Arcanum. Each census page has a list of surnames transcribed to a web page. The web interface is in Magyar (Hungarian). CAUTION: This is a commercial site. Often the information is initially available for free, but later on it is offered for sale. It is strongly recommended that you SAVE your images of interest locally. Peter Nagy has composed a very good tutorial on how to use the database. I have created an abbreviated set of instructions on using Arcanum, but Peter's work is more complete. You may query by any text, including but not limited to village name, estate name, surname. This is a "Urbarim Register" (possession inventory) for the Feudal Estates. It includes a listing of all village heads of household who owned property and its description. Not very useful for genealogy (family tree) research. Defines the goods and services that a serf was obligated to give the feudal lord. Includes names of landowners and serfs. Written in Latin. "Urbéri tabellák, 1767-1773", starting film number 1529947 , organized by county and village name. Uses old Magyar village names. FHL collection consist of all records from old Hungary, including many countries like Slovakia which are no longer a part of Hungary. This census would be good for the historical researcher. Practically no value for genealogical research. 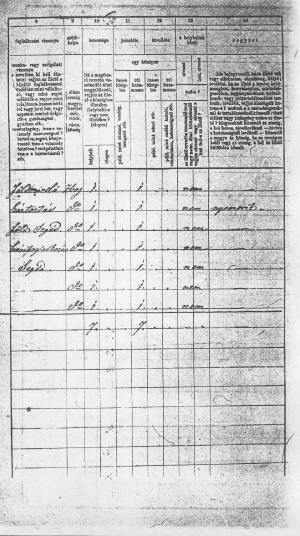 Juraj Kumičák writes that he purchased a roll of 1787 Census but discovered it does not contain any names contrary to what was claimed during ordering correspondence. It appears to be only a summary for the whole county. Juraj believes that Budapest keeps the sheets with the names but one can see them only paying a personal visit. Juraj plans to visit Budapest at some point to investigate (2005). A property and conscription census was conducted in 1828. Property holder census usually do not contain every village resident. Most often, the landowner, and sometimes the head of each household is listed, without detail as to their age or other personal data. Does not enumerate nobility. This census is written in Latin. Not very useful for genealogy (family tree) research. Miles Lambert sent me a note regarding a new Hungary National Archives (MOL) site for family research. Miles Writes: "It contains the (Ed. Note: Transcribed) 1828 census for Saros county ... The larger third of Saros county was at that time largely Rusyn, and the surnames are listed by village... As usual, the census cannot be considered complete, in the sense that not every family name will appear, since mostly they are listing taxpayers (taxable persons). Nevertheless, it reveals the whereabouts of many families at the time..."
JOHN ADAM has generously produced a Slovakia reference document (MS Word or PDF formats). Accented characters have been replaced with English characters. This document contains all counties in old Hungary, not only the Slovakia territories. Using this document is the only quick way to locate a village on the census. The FHL has NOT indexed these villages in their "place name" search tool, although using "keyword search" may help you locate a village. Resources: JewishGen has tabulated the Jewish population contained in this record and created a database with this information. The JewishGen site also contains census header information. Contains good introductory material and a description of the data items collected, along with a census example image. 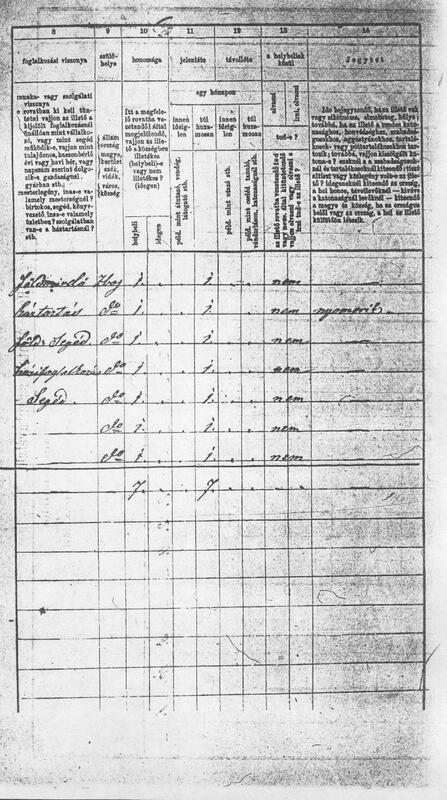 "Vagyonösszeírás, 1828, Census of the taxable population of Hungary, 1828", starting film number 622941, organized by county and village name. Uses old Magyar village names. This census is of limited value for genealogical researcher, showing primarily heads of household. Resources: JewishGen has conducted substantial work on the transcription of these records. See their 1848 Census Page for Details. The FHL has filmed these records for most of Hungary, including territories found in present-day Slovakia. A partial census of selected villages. The Family History Center contains records of old Hungary counties of Esztergom and Zemplén. Not of much value to the genealogical researcher unless your village is amongst the dozen or so listed. Village names in Magyar. 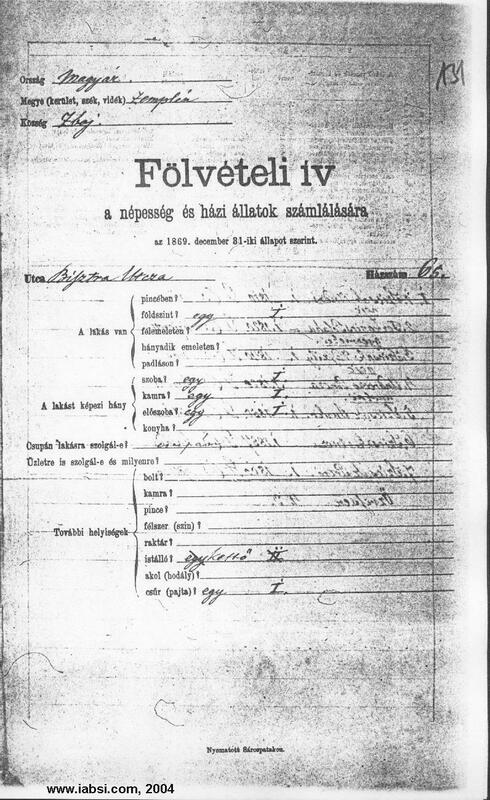 Copies of these census are found at the Family History Center, filed under "Slovakia", under the category of "Census", with the following heading: "Népszámlálás, 1857 : Esztergom " and "Népszámlálás, 1857 : Zemplén ". Starts with film number 720178. The 1869 census is the most valuable for genealogical researchers. Files for almost every village village existing in 1869 are included, organized by alphabetically, then by house number. The house numbers may have been assigned arbitrarily by the census taker, affixed to the house or some other method. There is no way to ascertain that a house number today corresponds to the house number recorded in 1869. The number of rooms, doors, windows, floors, barns and other outbuildings describes each house. Listed are each occupant’s name, role, relationship, birth date, birthplace, occupation, religion, ethnicity, literacy, and other items. Also included is a detailed inventory of livestock, probably their most valued asset. Examples are shown below. 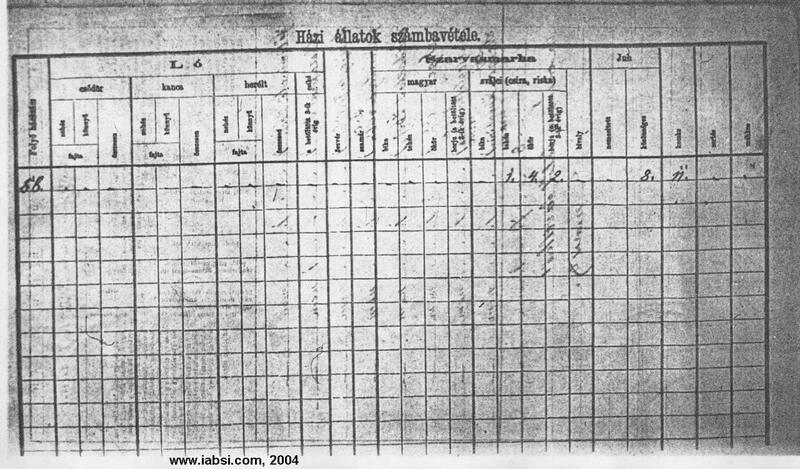 The census for and its record keeping was usually recorded in the Magyar (Hungarian) language. Some versions contain only Magyar, while others include a combination of Ukrainian and Magyar. Other areas of present-day Slovakia, especially to the West, contain may contain other languages, such as Slovak. The census contains one four-page entry for each residence. Each entry contains three parts: Livestock, Buildings, and People. All data was recorded on a columnar form. The documents are usually ordered as shown below, with Livestock page first. The "people" pages are in sets of two, and repeated if addtional pages were required. I have developed a Magyar-English translation chart for each of the column headers. These are by no means complete or 100% accurate, but do contain a majority of the commonly used words. It is quite simple for a reader fluent in any language to read these films, as they are tabular: name, birth date, religion, etc. Once one has become acclimated to what data are found in each column, it's easy to recognize surnames, given names, place names and numerical dates. A census overview and reading tips written by Nancy Kelly previously linked here is no longer available. The tricky part is that most village names had Magyar (Hungarian) names, quite a bit different from the Slovak place names in use today. 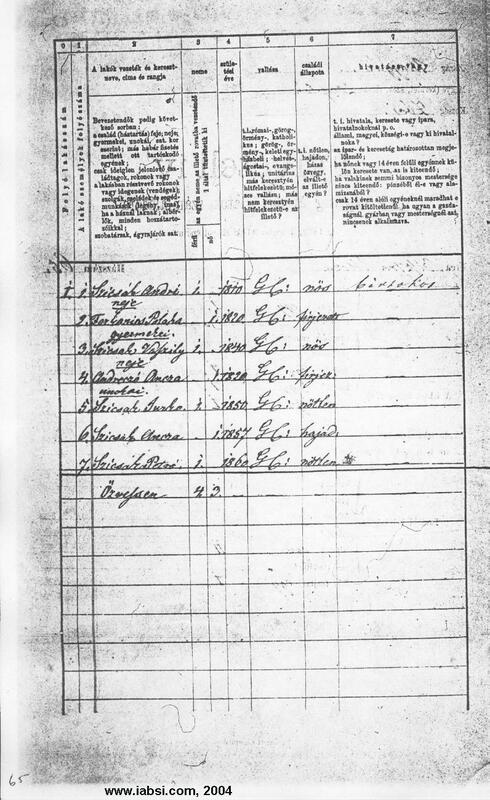 JewishGen Description of 1869 Census and transcription of Jewish entries. Here is another web page with 1828 and 1869 Census interpretations and 1869 samples. Bear in mind that a census is but a “snapshot in time.” It will not necessarily enumerate an entire nuclear family in one dwelling. Sons or daughters could be servants in another home, transient migrant workers, son conscripted to military service, etc. Younger children may not yet be born. Mothers may later die and the father remarries. In many cases, you will see a father/mother/children family living with an “old mother,” who is oftentimes the mother of one of the parents. So as you view these families, you must learn to read between the lines. Occasionally you will find two or three families in the same home. In rural villages, most homes were a one-space home, perhaps 15 feet x 15 feet, which makes for some pretty cramped living. Lucky for us, the Mormon’s Family History Library (FHL) has filmed the 1869 census (I can only speak with certainty about present-day Slovakia. The Ukraine portion is was not allowed to be filmed, though portions of present-day Hungary territories were filmed.) However, as of late 2003, they have only published census records for only eight of the former counties now in Slovakia: Szepes, Komárom, Sáros, Esztergom, Bars, Abauj-Torna, Zemplén and Nyitra. Since the Mormons will not publicly commit to any publication date, you have two choices: a) wait and uncertain wait or b) write to the regional Slovak Republic Archives (there is a fee for this) and have them extract the data for you. Luckier still, the Mormon’s have indexed the census by present-day place name, with a parenthetical reference to the old Hungarian place name. This will help you ascertain the old Hungarian name and vica-versa. Important: Note that only the VILLAGE NAME INDEX will be found online. No census data is available online (except for the handful of individuals that have independently transcribed their village.) You will need to visit a Family History Center near you to request and view the films containing the census. Go to the Family History Library main catalog search page. Search under "Hungary" (it covers Slovakia, formerly part of the Austro-Hungarian Empire). 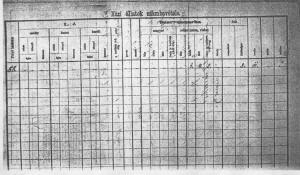 Copies of these census are found at the Family History Center, filed under "Slovakia", under the category of "Slovakia - Census - 1869 ", with subheadings organized by old county name. Notes: Az eredeti iratok mikrofilmrevétele Budapesten a Magyar Országos Levéltárban történt. 1869 census of Zemplén County, Hungary, which is divided now between Slovakia and Hungary. Starts with film number 2192680. On the films, places are listed alphabetically according to the Magyar (Hungarian) place name used in 1869. Modern Slovak names (or sometimes modern Hungarian names) are in the parenthesis. Look through the film notes. You will find villages organized alphabetically. The last several pages of the final film contain statistical summaries of the census. 2. FHL Keyword Search Go to the Family History Library main catalog search page . Do a keyword search and enter your (Magyar/Hungarian) village name. It will search all fields (including the film notes, where villages are noted in the 1869 census.) Results will also include any other reference to the village. It is a literal search, so if you spell it incorrectly, your mileage will vary. You will still need to either scroll through the film topic index to find the exact film number or use the survey tables I've compiled below. It is best when you want a quick read on whether or not the FHL contains records a specific village. I compiled these data tables which cross reference historic names to present-day names. I have compiled a set of indexes for the place names presently listed in the 1869 Magyar Census material for Slovakia as held at the Family History Library. Until "Keyword search" facility became available in 2003, this was the best way to locate a village. It's quite useful when you know what the village sounds like, but don't know the precise spelling. Sometimes skimming through an ordered list is a useful approach. A town-by-town count of religious congregants, organized by faith and summarized by district and county based on the 1877 Magyar Census. Sometimes called an "Ecclesiastical Census." Contains an indication of the location of the primary parish. Used as the source data for the Dvorzsák Gazetteer and the Genealogical Gazetteer of the Kingdom of Hungary. It is only available at the Hungary National Archives. Take care in their use however. Most dictionaries, print and electronic utilize contemporary spelling and vocabulary only. You may often find Magyar words that are not listed in any dictionary you have access to. In this case, it may be reasonable to assume it is written in an alternate form / old style of Magyar spelling. 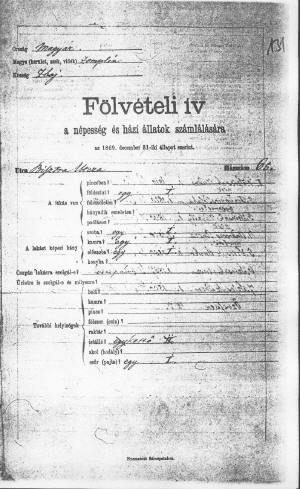 Frequent Hungarian terms oft found in the church registers have been compiled by John Jaso. There are only a few words in this list that are relevant however for use with the census. Prior to emancipation of the Serfs in the 1850's, an exacting stratification of villager's roles existed. Most of the titles are obsolete today. References to the stratification terminology are listed below and can be helpful in decoding pre-1850's census, tax and land records. Hungary's Ethnic German Farmers around 1800, Felix G. Game - while this page was written with Germans in mind, the description of the four social levels is extremely valuable. The scope of this website is limited to peasant stock. Research of nobles is fairly well supported by various organizations and endeavors. (Second edition of Administrative Atlas of Hungary 1914) "Magyarország közigazgatási atlasza 1914", Talma Publishers. This is a wonderful book, worth purchasing if you are interested in a snapshot in time of the entire region. For each village it not only contains fairly detailed period map, but an Index of Village names used in 1910 to 1914. For each village, the population, ethnic and religious makeup is provided. It can also give you clues when trying to determine what church your family went to and where it could have been located. The data is taken from the 1910 Census and the 1913/14 Gazetteers. This census did not survive.